Located within the perimeter of the airport, the Hilton London Stansted Airport hotel is six minutes by shuttle bus from the terminal. 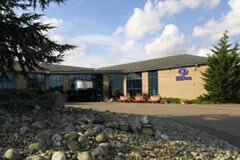 This airport hotel is just 30 minutes from central London by train near Stansted's popular attractions. Stay active enjoying a workout in the 24-hour fitness center. All rooms are en-suite with tea and coffee making facilities, telephone and colour televisions. Parking is on site at the hotel. Guests arriving at the hotel are required to check in at the hotel reception before parking their car. 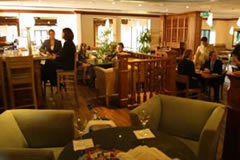 The hotel offers a Carvery and A La Carte menu. Hotel club has a fitness centre. Under 16's are not allowed to use the gym. Children sharing a room with adults must be 16 years or under. Front of the hotel and reception area looked 5 star, the room was fine but not quite so plush. Instructions said to check in at reception before parking the car but reception did not seem to be aware of that. Bus service to Stansted was good. On return, the information we were given said the bus would be at bay 27. We were rushing as it was almost half past and bay 27 was not correct. By the time we found the correct stop - Bay 20 we had just missed the bus and had to wait an extra half an hour, not what you want after a long journey. Information needs correcting. Comfortable, clean and friendly hotel . Very comfortable bed and quilts. Very convenient. Would use it again in future. We have used this hotel 3 times now prior to flying from Stansted. 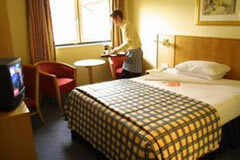 The rooms are always spotlessly clean and the staff friendly, helpful and efficient. There has always been ample spaces in the car park, they don't take your keys or move the car while you are away. Airport transfer run half hourly and cost Â£6 return. The pool is lovely too. We can't comment on the food as we always go out to eat and have breakfast at the airport. Very easy to find, good parking. Professional & efficient staff.Clean & functional room. Transfer to airport easy. Good stay at Hilton easy parking .good size family room proper extra bed not just a put me up bed . Drinks and food perhaps a little exspencive but opptional . Shame you have to pay on bus to airport as that wasÂ£3 each way per adult . But over all ease off booking and valu good . It all worked out very well. Look forward to booking through next time. Provides an efficient service for both parking and hotel stay. Easy to use and to find. excellent pick up service to and from airport. No problems. Ideally placed hotel. Local parking was only about £30 cheaper so a night resting before an early flight was great. I went away refreshed and didn't lose a day from being too tired. Staff were really great. Parking was safe and very close to the airport. Highly recommend! We have used this Hotel (Stansted Hilton) on many occasions and have always been well satisfied with the services provided. Very convenient for parking and staff most friendly and helpful. Highly reccomended. Hotel was fine but could have done with additional staff. We stayed for a meal in the restaurant on our return & were pleasantly surrprised with the excellent quality of both the food & the service. Hilton Hotel excellent, received free room upgrade. The Hotel is at Stanstead Airport. Exit Junction 8 of the M11 or A120 and follow signs to Stanstead Airport. At the roundabout, take the first exit and then take the first road on your left (this should be Round Coppice Road). The hotel is situated at the end of this road. The shuttle bus operates between the hours of 04.15am and 01.00am outside of these hours guests are advised to travel by taxi. The shuttle bus departs from bay 20 of the coach park at London Stansted Airport. In order to get to the hotel from the London Stansted Airport train station take the lift or escalators up one floor and follow the signs for the coach station. The hotels shuttle bus departs from bay 20 of the coach station. The shuttle bus from the airport to the hotel departs the airport on the hour and 30 minute past the hour. The shuttle bus departs the hotel to the airport at 15 minutes and 45 minutes past the hour. The fee is £3.00 per adult per journey, payable to the shuttle driver or at the hotel reception. Children under 16 travel free.